Twenty teens in Lynchburg, Tennessee paid a total of $1,800 to rent a top of the line party bus for their Prom. They had contacted Superior Transportation. They were informed that because of the busy season with proms and weddings there was only one party bus remaining and they needed to hurry and reserve it. The teens and their family expected to get one as seen on Superior Transportation’s Web site. 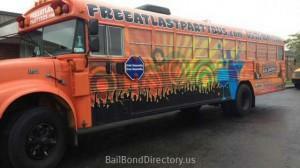 Unfortunately, what arrives is the bright orange “Free At Last Bail Bonds” refurbished school bus. Superior Transportation, based out of Orlando, Florida sub-contracted the Free at Last party bus without telling the group of parents and teens or Sedan on Demand, the operators of the orange bus. The teens and their families were not advised that Superior Transportation was going to subcontract the bus out. The teens are not the only ones who feel misled by Superior Transportation. Sedan on Demand was paid $740 by Superior Transportation for the rental of the Free At Last party bus. Sedan on Demand, said that if a client called us locally here in Nashville, they would describe the bus to them, direct them to go to the Web site and look at the bus and see if that’s what they wanted. The driver of the Free At Last bus offered to leave, however parents said they had no choice but to send their children off in the orange bus by that time. The parents do not hold the Free At Last party bus responsible for the prom night disaster. Established to assist you understanding the bail process, anticipate what to expect when posting bail, and to help you locate & select a professional bail bondsman that is best suited for you, your friend or loved one to get out of jail as quickly as possible. Bail bond information varies from state to state, but understanding the basic rules regarding posting a bail bond will help you make a more informed decision when time is of the essence. Posted on May 1, 2013 by US Bail Bond Directory. This entry was posted in Bail Bondsman, Entertainment and tagged free at last bail bonds, lynchburg, party bus, sedan on demand, superior transportation, Tennessee. Bookmark the permalink.